Posted by Rob Schaerer on Tuesday, September 23rd, 2014 at 9:09am. 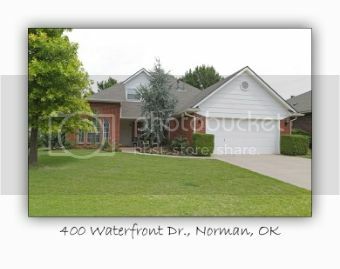 400 Waterfront Norman, OK Just Listed! Large corner lot in Royal Oaks! Open layout with great light! HVAC in 2012 and it has a storm shelter! Second living area is a large loft overlooking main living area. Split bedroom plan with separate tub and shower in master suite and separate backyard access from master. Right across the street from the neighborhood lake access and close to the park!